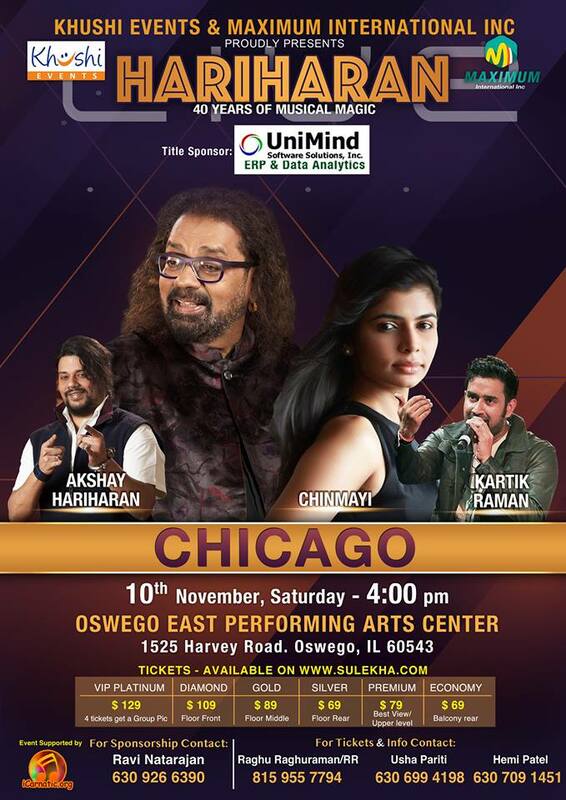 Oswego east Performing arts cente ..
Padmashri HARIHARAN - the golden voice of India is celebrating his 40th year in career. He is going to be in CHICAGO, IL on the 10th of November, as a part of this celebration. He will be joined by the ever Charming CHINMAYI for a high energy, multi lingual concert, covering Hindi Tamil and telugu and Malayalam songs. Live band and a special DJ segment is the latest attraction, by AKSHAY HARIHARAN. Spend the most musical evening ever, with the USTAD of Indian music.